Calozzi’s Will Feed Your Cheesesteak Cravings! Wow. Seattle Oasis Vacation Rentals does not have an official Philly Cheesesteak place on our list of restaurant recommendations, and rarely direct our guests to locations away from our restaurant-dense Belltown stomping grounds. But when my husband invited me for a quick bite to eat on a recent rainy early afternoon, I had no idea I was walking into cheesesteak nirvana. Calozzi’s is a Pioneer Square fixture since 2010 that has recently branched out to the industrial Georgetown neighborhood, which is where I found myself (pictured above). Both locations are holes-in-the-wall, but don’t be fooled by the less than luxurious digs. The food here is FOR REAL. I’ve never been to Philly, so completely unqualified to chime in on the Whiz-No Whiz (that would be Cheese Whiz for the uninitiated) debate. My love for the namesake sandwich comes from its perfect marriage of meat and cheese. 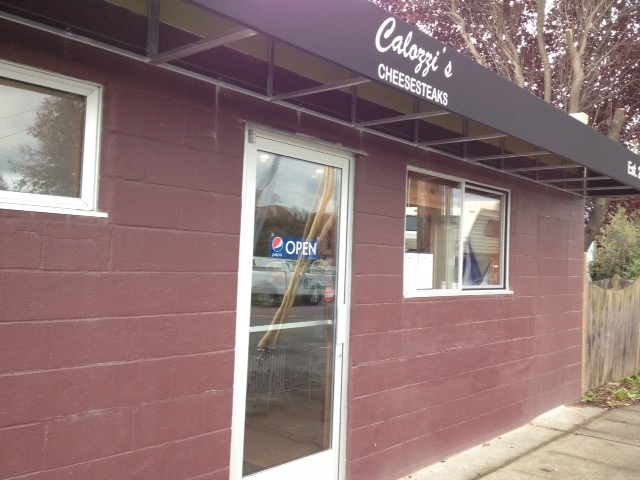 That being said, I was excited to try Calozzi’s. My family ordered a Pepper Steak with American, a Donnie’s (mushrooms) with Whiz, and a Pizza, and passed them around. Not a loser in the bunch. The meat is diced fine, and meat and onions are evenly disbursed with the peppers or mushrooms. The Pizza has a hearty red sauce. The roll soaks up the juices as best it can, and is robust enough to not fall apart, but these are messy sandwiches in the best sense of the word. Flavors are exactly what I was wishing for; savory meat and gooey cheese. All were hearty and filling, with that warm ember of coal in the tummy, food-coma fullness that makes for a cozy afternoon on the couch this time of year. Prices are a fair $10 per foot long sandwich, $1 more for the Donnie. Menu is limited but this is good, real (well maybe discounting the Whiz—won’t start that fight) food done right. They have fries (which I did not partake in on our recent visit, and didn’t need as the sandwich filled me up), also with or without Whiz, and bottled pops. Location closest to the condos is at 115 Occidental Ave S in Pioneer Square. Closed Sundays, open late night on Thursday, Friday and Saturday nights. King Tut is Almost Gone Forever!